Discussion in 'Hardware Components and Aftermarket Upgrades' started by unclewebb, Nov 7, 2010. Thanks for the post. That was exactly the problem! I couldn't believe it myself. I mean the options are greyed out which implies that they shouldn't affect it yet they do. It may very well be a bug. Is there a tutorial on how to overclock the 4700MQ and how to control voltage (undervolt)? The laptop in question is an Alienware 18. @illuzn - I posted a link to your guide in the first post in this thread, near the top, so hopefully others can find it. Thanks. @Mobius 1 - For the 4700MQ, all of the important stuff can be found in the FIVR window. 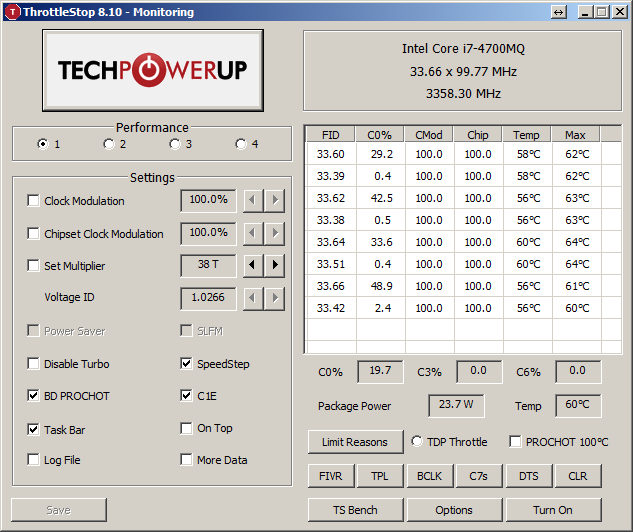 Unless you are running a modified bios with the early microcode, overclocking will be limited. My 4700MQ is running microcode 0x1C so the max multiplier when a single core is active is 36. 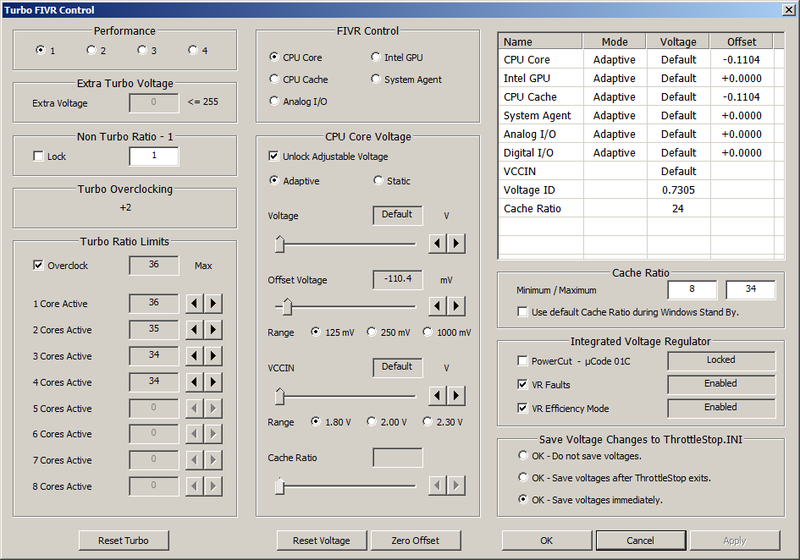 There are a wide range of voltage adjustments available in the FIVR window. Post a screenshot of that if you need some help. With FIVR, core and cache is -80mv. But does not seem to respond to unvervolt when running AIDA64, undervolt work with throttlestop bench. 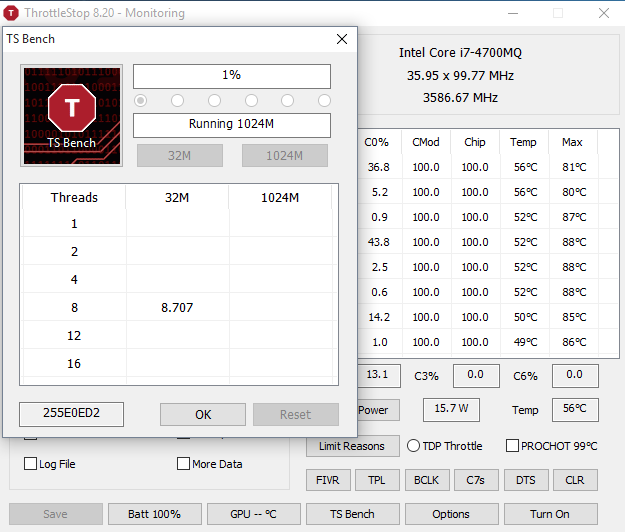 Multiplier all cores is set at 34, but single thread TS bench doesn't push it above 34. 8 thread bench stays at 34 multipler. What do you mean by this? What kind of response are you looking for? In the FIVR window if you have set all cores to 34 then you will not have access to the 36 multiplier. An overclocked 4700MQ should look like this so the CPU can use the 36 multiplier when a single core is active. You should see the multiplier approach 36 during a single thread TS Bench test. You also need to have the core C States enabled (at least C3). Ok, I fix to 36/36/34/34. But with throttlestop single thread, still 34. -50mv on core and cache. But with throttlestop single thread, still 34. It should be 36, 35, 34, 34. Are your C States enabled? They need to be enabled so the CPU can access the 36 multiplier. Make sure the Set Multiplier value is set correctly too. If you are having problems, click the Set Multiplier box and set that to 36T. Also post a screenshot of the C State window when your CPU is idle so I can see what C States are being used. 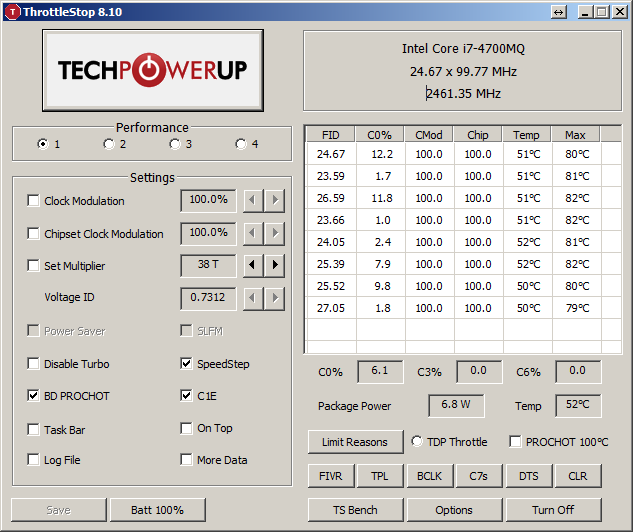 Are you using the Windows High Performance power profile? Your low multis are screaming Balanced Profile. Also set your Non Turbo Ratio to 0 when testing. I am not sure how 38T ended up in the Set Multiplier box. Were you using this version of ThrottleStop with a different CPU? Some people put ThrottleStop on a USB drive and then swap it in and out of various computers without deleting the ThrottleStop.INI file which has all of the specific settings for each CPU. The multiplier box checked and x36, not working with single thread. Throttlestop I downloaded from your signature, not copy from usb. are there command line options for ThrottleStop?